Full disclosure - I have a teeny investment in this play. What sold me? It’s in it’s forth year in the West End playing to a packed house each night. The Lyceum Theatre is small and intimate (950) Not a bad seat in the house. 4. Theatre goers need mindless and silly these days. And, mindless and silly it is! I took my friend Debbie to opening night. I knew she’d love it. She’s been laughing at my jokes for thirty years, so she obviously has a highly developed sense of humor. The show is a show within a show. The Murder at Haversham Manor is the play that’s doomed by dead bodies moving, scenery collapsing, actors colliding and lines muddled. It’s hilarious to see and best of all each movement is done with incredible precision. It’s a circus in the best sense of the word. Written by three crazy Englishmen, Henry Lewis, Jonathan Sayer and Henry Shields, who I couldn’t wait to see at the afterparty at GUSTATINO’S (a very cool place that is actually underneath the foundation of the 59th Street Bridge.) When else would I be able to use the word “bloody” as I rave about a performance? I wasn’t able to catch them, but I did see Director Mark Bell, and a few of the the producers, Kevin McCollum, J.J. Abrams, Kenny Wax, Catherine Schreiber, Ken Davenport, Corey Brunish and Jamie deRoy. None of them are English so throwing in “bloody” every other word kinda made them stare at me oddly and move away quickly. 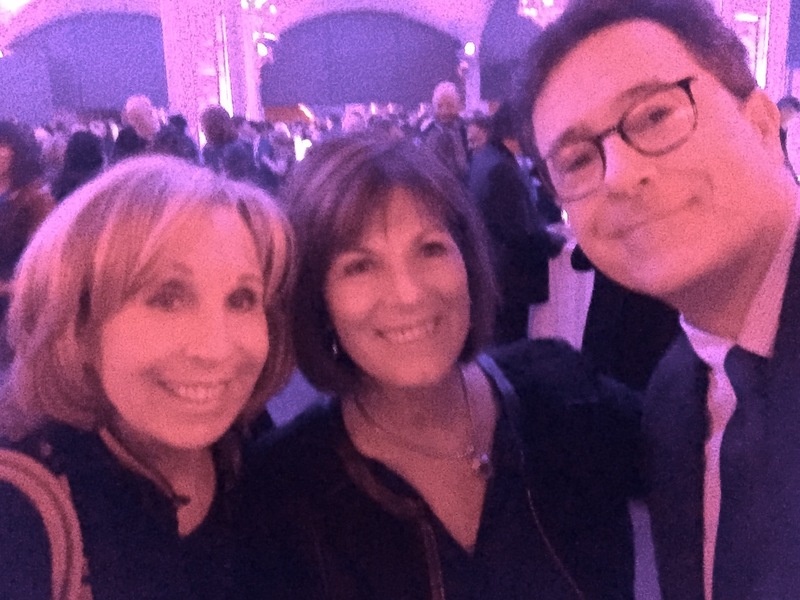 I was having a ball, anyway, first taking a photo with Debbie, then stalking Stephen Colbert for a selfie and by tackling J.J. Abrams I got a reddish bluish photo with him. (there was reddish bluish lighting in the room and of course, I don’t know how to adjust the color) I turned to ask J.J. but he was already gone. Buy a ticket to THE PLAY THAT GOES WRONG. I will make about four cents on it, and you’ll have a bloody good time.